Join me on the Clean Cleanse from January 13 to February 2, 2014! I know with the beginning of the new year starting, a lot of you are looking to make a healthier change in your life. 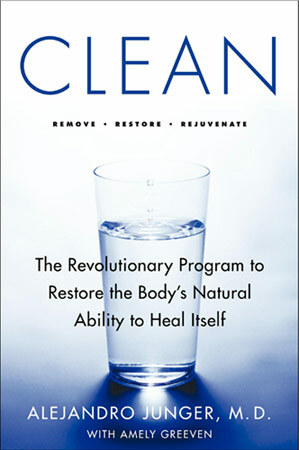 I've been seeing an increase in hits for information about The Clean Program and happy to have heard from those of you who've reached out already to tell me about your progress so far. Two years ago, I was introduced to this 21-day cleanse by Dr. Junger and became a believer after reading his book, CLEAN: The Revolutionary Program to Restore the Body's Natural Ability to Heal Itself. I love this cleanse because unlike a juice cleanse that puts you on autopilot, the Clean Cleanse encourages you set new routines and makes you think about the foods you eat and how it affects your body. Doing anything for three weeks will allow you form new habits and can help you to learn something new about yourself. I really enjoy the new perspective that being on this cleanse gives me and I truly believe that you'd benefit from it too! Usually, I've started the cleanse in March, but this year I really wanted to jumpstart 2014 in a healthier way so I'm starting it tomorrow, January 13st. I know in your busy life, it's hard to schedule off a full 21-days in your calendar for a chunk of time when you're not traveling, have signification celebrations or events that will bring temptation for you to break the cleanse. But in the midst of chaos, really try to block some time off for yourself, to focus on you. I know this sounds cheesy, but is there anything that's more important than your health? Personally, the last three days of this cleanse will be really hard for me. January 31st is Chinese New Years, February 1st is my cousin's birthday celebration (Hello Tonga room in SF!) and February 2nd, the last day, is also SuperBowl Sunday! Ahhhh! The torture. I love SuperBowl parties for the fatty snacks. When I was first writing this blog post up, I was going to tell you that I was going to end my cleanse 2 days early so I can join the festivities. However as I was drafting this up, I realized how stupid it sounds when I've been trying to tell you to enjoy the full benefits of taking care of yourself. So, I'm determined now more than ever to try to find new ways to celebrate. Thank you for keeping me accountable and motivated!! So, with that said, if you've found my blog because you've been wanting to try the Clean Program, then please join me on this cleanse! If you can't start tomorrow, start next week. Just pick a time that works for you and join me in restoring your body, mind and health. My leadership teacher from high school always reminded us of the 5 P's: Proper Preparation Prevents Poor Performance. In order to make sure you succeed on this cleanse, you have to make sure you prepare properly and that means getting all the things you need a few days before the cleanse. I always make sure that I have at least several ingredients that I need to make clean smoothies, prep a clean salad for lunch, and ingredients for a good blended soup. I've shared my grocery list in the past and it's still pretty close to what I follow. With your fridge stocked with food and vegetables that are clean approved, it'll make it easier for you to prepare your daily meals. This year, I made a quick trip to Trader Joe's to buy these items. Everything else that you need to know about this cleanse is on the Clean Cleanse page of my blog. Make sure you read through it and let me know if you have any questions. Also since I'm not buying the $425 Clean Kit, I buy some of the supplements that I've found to be good substitutes for my own DIY Kit. This year, I will be trying the Trader Joe's Complete Body Cleanse to test it out. My initial thoughts is that it's made from the same manufacturer as the Whole Food's 365 Complete Body Cleanse that I tried last year with a lot of success. I've also already bought the supplements that I've outlined in my DIY Supplement list, but if all you can do is buy one of the body cleanses from either Whole Foods or Trader Joe's, you're already off to a good start! Try New Recipes & Post Them! I know I said this last year but I really do want to try more clean recipes. Sometimes I tend to stick to what I know and don't branch out as much as I should. In the next 21 days, I want to aim to put up 7 (or more) Clean recipes on this blog for you to follow along. Keep me accountable! Find CLEAN friendly solutions for my last 3 days. As mentioned above, 1/31 is Chinese New Year, 2/1 is my cousin's birthday celebration and 2/2 is SuperBowl Sunday. These three days are seen as "triggers" for me to want to break cleanse. Instead of giving in to these temptations, I'm going to work on new ways to make the elimination diet work for me. Use the sauna more. Dr. Junger recommends this as an extra way to detoxify and it's a great way to break a sweat. I want to make sure I use the sauna at my gym more post-workouts. Try more vegan restaurants. Because of the cleanse, I have discovered some of my favorite healthy restaurants in NYC. This time around, I want to continue my exploration and see if I can add to this list.